What’s better than being king? Being a god. Ngmoco’s new mobile games will let you do both. I met with Clive Downie, Ngmoco’s vice president of marketing, at the Game Developers Conference Tuesday to discuss his company’s new epic social strategy games—We Rule and Godfinger—that are coming out for the iPhone, iPod Touch, and iPad. Both games are due out in the App Store in the coming month and will be free to play. 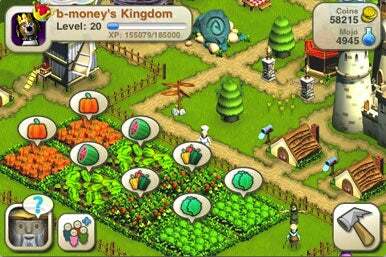 Crops help raise money for your kingdom in We Rule. But be warned—those crops grow in real time, and you better be around when it’s time to harvest them. We Rule is a social kingdom building game. Think of it as Sim City: 500 AD. The basic premise is you’re trying to build a kingdom through the acquisition of experience, castles, businesses, crops, and people. But your kingdom isn’t just an isolated country; rather, it’s part of a larger social world. Your friends can help you by giving you goods and services. Through cooperation, both you and your friends will earn more gold and expand your kingdoms faster. During the demo, I got to see Ngmoco’s Downie demonstrate the tax collection and farming aspects of the game. Your citizens will owe you taxes periodically and collecting them is a simple matter of clicking on the individual house. You can also earn gold by planting crops. Depending on what kind of crops you grow, you can either get a little amount of gold very quickly or lots of gold after waiting a longer time. Rice, for example, will take only a few minutes to grow but other crops like watermelons can take several hours. This may seem like an arbitrary distinction, but there’s a catch: if your crops aren’t collected, they wither and die. So if you leave the game for several hours, that rice will have died and you’ll have to clean up the mess. According to Downie, the game takes place in real time and lacks a pause function. Therefore, amateur kings and queens will do well to plan crop planting around their busy schedule. Downie also demonstrated some of the more social aspects of the game. With a quick gesture of his fingers on the touchscreen, he was able to zoom out from his kingdom, check out his friend’s, and then order some magic potions from his friend’s shop. Through this interaction, he’ll gain magic and be rewarded by the game for the cooperation. Effectively, both sides benefit. It’s also a cinch to look at other kingdoms to see what buildings they have and how their city is laid out. It’s completely free to redesign your city, meaning the more architecturally-savvy gamers out there can make their city as orderly or chaotic as they’d like. Like many of Ngmoco’s titles, We Rule is free to play but includes in-app purchases. Getting “mojo”—a potion that accelerates the growing of crops—will set you pack a dollar or two, as will other bonuses. While you’ll have plenty of power playing a king in We Rule, Godfinger lets you play god—literally. Godfinger is a cartoonish god simulator with a social aspect. Having devoted followers in Godfinger has its rewards—monetary rewards in this case. The ability to fling your followers around the screen, terraform the planet, and govern how your followers live are all elements of gameplay reminiscent of the Black & White series, but Godfinger offers something new—other gods on other planets. You could dedicate a worshipper of yours to a friend and the relationship the two gods share will benefit both financially. Downie clicked on a little bearded mystic of his who was drawing gold to him thanks to a diplomatic relationship with a friend of his through Ngmoco’s network. Godfinger also looks really slick. The characters are adorable-looking and fun to throw around the screen. The little buildings and plants illustrate a unique art aesthetic that is both compelling and familiar. You can guide your worshippers to farm certain land, and they’ll tell you what they need—water, rest, sun, and so forth. You can drag a cloud over to a thirsty section of your planet and cast rain on the farmer with a simple tap. The follower will then get to work farming and produce gold for you. 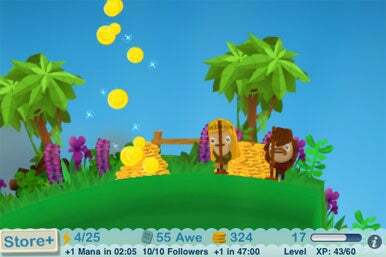 The in-app purchases in Godfinger will be tied to “awe,” a game currency that grants players other godly powers. Enough awe, and you can resurrect your dead worshippers, make them work harder without tiring, heal them, and much more. While Downie remains mum on how Ngmoco is developing for the soon-to-be-released iPad, he assures me that the game maker has been working hard to develop for the platform and expects to see both We Rule and Godfinger on the platform.